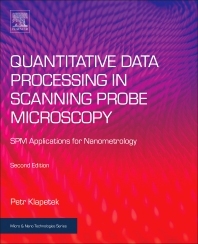 Quantitative Data Processing in Scanning Probe Microscopy: SPM Applications for Nanometrology, Second Edition describes the recommended practices for measurements and data processing for various SPM techniques, also discussing associated numerical techniques and recommendations for further reading for particular physical quantities measurements. Each chapter has been revised and updated for this new edition to reflect the progress that has been made in SPM techniques in recent years. New features for this edition include more step-by-step examples, better sample data and more links to related documentation in open source software. Scanning Probe Microscopy (SPM) techniques have the potential to produce information on various local physical properties. Unfortunately, there is still a large gap between what is measured by commercial devices and what could be considered as a quantitative result. This book determines to educate and close that gap. Petr Klapetek is Head, Department of Nanometrology at the Czech Metrology Institute, Czech Republic. His research focuses on the metrology scanning probe microscope (SPM) construction, a key standard for nanometrology.He also participates in the Gwyddion project, focused on the creation of multiplatform open-source software for scanning probe microscopy (SPM) data analysis.